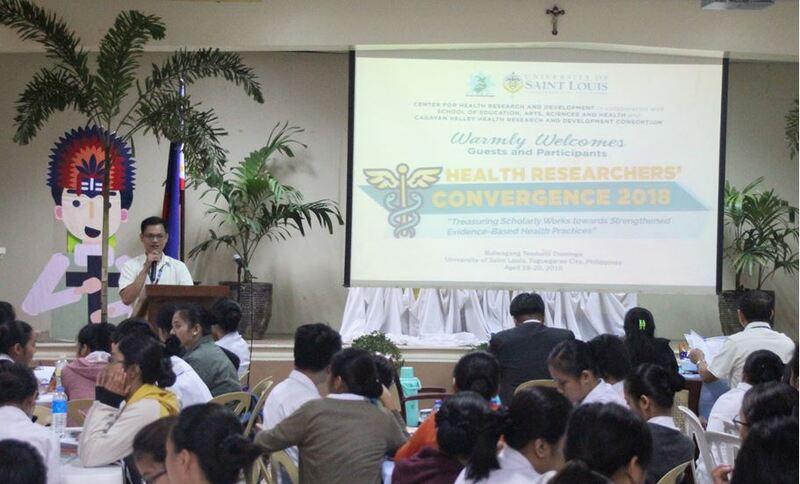 Tuguegarao City – The University of Saint Louis (USL), through its Center for Health Research and Development (CHRD) and in collaboration with the School of Education, Arts, Sciences, and Health (SEASH) and the Cagayan Valley Health Research and Development Consortium (CVHRDC), held the Health Researchers’ Convergence 2018 with the theme “Treasuring Scholarly Works through Strengthened Evidence-Based Health Practices” on April 18-20 at USL’s Bulwagang Teodulfo Domingo. The two-and-a-half-day convergence was participated by 195 health practitioners, faculty and students from higher education institutions (HEIs), hospitals, clinics, and a local government unit in Region 02. Dr. Honorato R. Alzate, Director IV of the Commission on Higher Education (CHED) RO2, stressed in his keynote address the increased productivity of the Region when it comes to presentation of health research results. Also during the opening ceremony, Dr. Emmanuel James P. Pattaguan, USL Vice President for Academics, further set the tone of the convergence by discussing and facilitating interaction on the roles of HEIs in evidence-based health practices. Moreover, Dr. Julius T. Capili, CVHRDC Executive Director and dean of the College of Allied Health Sciences (CAHS) of Cagayan State University (CSU) Andrews Campus, discussed the significance of enforcing ethics in health researches. The researchers under Professional Category were composed of medical technologists, nurses, a pharmacist, and educators. They were Karen Mae S. Alcantara, MSN; Archimedes O. Bayquen, RPh, MPH; Judy Mae M. Dimaya, MSN; Jonas Usbal Dupo, MSN; Reymel B. Magora, RMT; Jack M. Regala, RMT, MPH; Amiel F. Reyes, MSN; and Jonalyn P. Santos, MSN. Meanwhile for Student Category, the researchers were: Jade Mar C. Clemente, Rucriz Serbeth Q. Guimmayen, Trixie Carla A. Laniog, Rell Genesis C. Mandac, Mart Louie C. Oamil, Lyra Naveen A. Paudan, and Jedediah Faye D. Siniguian. They are BS Medical Technology/Laboratory Science, BS Nursing, and BS Pharmacy students from CSU, Medical Colleges of Northern Philippines (MCNP), and USL. A total of 19 researches were presented: 9 in the professional category and 10 in the student category. In addition to the presentations and exchange of ideas, the participants were enlightened on the approved and existing Regional Unified Health Research Agenda (RUHRA) 2017-2022 through the presentation of Dr. Melfei Estrada-Bungihan, chairperson of the CVHRDC Research Management Committee (RMC) who is also a faculty at Quirino State University (QSU). Dr. Teresita A. Tabaog, Assistant Regional Director for Technical Operations Services of the Department of Science and Technology (DOST) RO2, graced the closing ceremony by sharing on the agency’s science and technology programs. She also encouraged the health researchers to apply for grants from the agency for the constant advancement of science and technology in the Region. Capping the convergence, the Best Oral Presentation award for each of the two categories was given to Professor Jack M. Regala for “Hypoglycemic Effect of Guyabano (Annona Muratica Linn.) Fresh Peel Aqueous Extract in Glucose-Loaded Sprague Dawley Rats” and Mart Louie C. Oamil for “Status of District Hospitals in Cagayan Based on the Regulatory Standards Set by the Department of Health-Bureau of Health Facilities and Services (DOH-BHFS).” Both are from CSU. The judges were: Dr. Capili; Dr. Estrada-Bungihan, Dr. Pattaguan, and Mr. Darin Jan C. Tindowen, head of the USL Center for Social Innovation, Local Knowledge and Educational Research (CSILKER).